In celebration of its anniversary, Pokemon Go is undergoing some major changes. Before you get too excited, no, player-vs-player battles aren’t among them. Gyms, though, are about to get more accessible, and you’ll soon be able to team up with friends to go on raids against mega-powerful Pokemon. The gym overhaul should launch at some point today (Update 6/19/17 12:30 PM: Niantic says it’ll only launch for select players today and roll out to everyone else in the coming weeks). 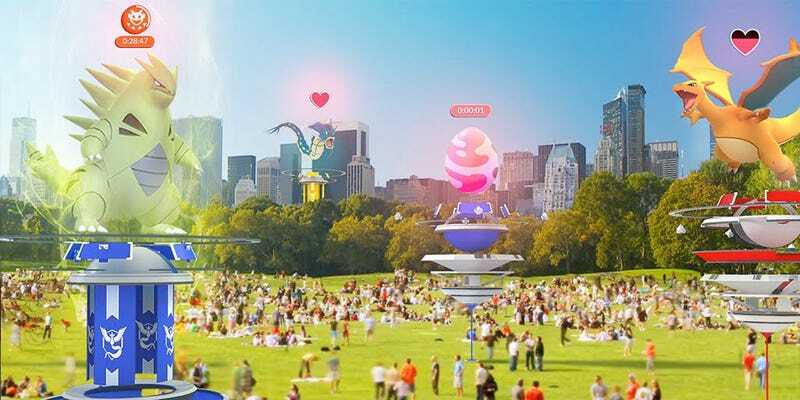 Developer Niantic is hoping it’ll turn the feature into something that’s interesting for everyone, rather than just players at the tippity top of the food chain. Here’s how it works: Gyms will soon have six slots that can be filled by one team’s Pokemon, and Pokemon presiding over gyms will have a new stat called “motivation.” Even if you can’t knock a rival team from their throne, their individual Pokemon will lose motivation over time and as a result of defeats, temporarily lowering their CP. So basically you’ll be able to aid in chipping away at them, if nothing else. However, members of the controlling team can raise Pokemon’s spirits with berries, making both sides of the equation a cooperative effort. For your efforts, you’ll be able to earn gym badges, which you can level up to potentially get better items at PokeStops and gyms. On top of all that, gyms are getting spinnable “photo discs” (ala PokeStops) in order to hopefully alleviate some of the problems faced by players in less densely populated locations. Raids, meanwhile, should be arriving in “the weeks ahead,” first to select players as a beta. They’ll allow you to team up with nearby players of any team in hopes of bringing down Pokemon too powerful for any individual to knock unconscious and stuff in a ball. Raid events will also occur at gyms, temporarily superseding usual gym shenanigans and sending Pokemon back to their trainers. When a raid boss appears, up to 20 players will be able to battle it at once. If you bring it down in five minutes, you’ll get a shot at capturing it. You will, however, need a “raid pass” in order to participate, and you can only get one a day from gyms... unless you’re willing to fork over some cash to get a premium raid pass from the in-game shop. During E3 last week, I got to try out a raid, and while I can see the appeal of endgame content in Pokemon Go, the whole thing was a bit too chaotic for my tastes. As I darted around to avoid the raid boss’ (a Gyarados with its CP jacked to high heaven) attacks, friends’ Pokemon often obscured my view, and all the effects on screen caused slowdown. In light of that, it’s good to hear that Niantic plans to take its time with the roll-out, because I’m not sure raids are ready for primetime just yet. Pokemon Go players have decried the lack of an endgame for nearly as long as they’ve had a game to play, and these new features at least give them options. It’ll be interesting to see how much lasting appeal they have, though, as well as how other long-awaited elements—like legendary Pokemon—tie in. As Pokemon Go’s initial mega-success proved, it’s one thing to get people curious; it’s another to keep them coming back.